Ah cake, it feels so nice to be able to make you! It's been a while since I've been asked to make a cake, so when this particular one came to me I was so stoked. We've been pretty busy with our Etsy store and keeping up with the orders of all those edible decorations...so to be back in the kitchen and actually baking, feels really good! The best part about that school (to me at least) was the ability to bring what you made home and..well..EAT IT! This is where I found that I, Christina...love Black Forest Cake!!! A little side note- I was just reminiscing with an old culinary school friend about this very cake and he jokingly said "After that week I was so sick of Black Forest Cake! I'd die happy if I never ate a slice again! I have bad memories of eating one until I was sick." Basically that's how it was- you were so submerged in one particular thing, baking or cooking it until perfection that by the end of that lesson you hoped you never had to eat that thing again. Haha. BUT...I will say, I am so very happy to eat this cake still, today! So needless to say when I was asked by a family friend for a Black Forest Cake I was just completely excited. Moist and fluffy yet super chocolaty cake is drenched with a black cherry syrup (again, no artificial flavorings here- it's purely black cherry juice in this syrup), layered with some sweetened cream frosting and black cherry pieces, coated in more sweetened cream frosting and finished with chocolate cake crumbs and maraschino cherries. Just like how we did it in school, just like how it is traditionally done, but still Sweet Lavender Bake Shoppe'd up! This cake has quite a few steps, but rest assured they are not hard. Just...step-ish. Once you've got all your components (or mise en place) you'll find that this cake actually comes together quite nicely! 1. Preheat your oven to 350*F. Lightly grease a 10" cake pan, cover bottom with circle of parchment paper, and spray again. Set aside. To make a circle of parchment, simply trace the bottom of your cake pan onto a sheet of parchment (in pencil) and cut out. Then when you place in pan, place pencil side down. 2. With a mixer, whip your eggs and sugar until you've reached the ribbon stage- light yellow in color and thickened up. 3. While this is happening, sift together all of your dry ingredients. In a separate bowl, mix together all of your remaining wet ingredients. 4. When you've reached ribbon stage, stop mixer and scrape down bowl. Turning back on to low, alternately mix in the wet with the sifted dry ingredients, stopping and scraping the bowl every so often. Once all ingredients have been added, mix together once more. Try not to over mix as this will cause a dense cake. ***YOUR BATTER WILL BE RUNNY! DON'T WORRY, IT'LL BAKE UP PERFECTLY. 5. Immediately pour into your cake pan until 3/4 way up cake pan. If you have any extra batter left over, I suggest pouring into cupcake pans with liners and baking :) Then just freeze for another time! Bake cake until cake bounces back when touched in middle and a toothpick comes out clean. Check after 30 minutes. Everyone's oven is different- after 30 keep baking in 7-8 minute intervals until cake is done. 6. Let cool on wire rack until room temperature. Or for best results, cool, wrap in plastic and refrigerate overnight. 1. In bowl of your mixer, whisk your very cold heavy whipping cream until slightly thickened. Then with mixer still going, add in your vanilla bean sugar. 2. Mix until stiff peaks have formed and transfer some to a piping bag fitted with a large star tip (Ateco 826 or Magic Tip 8ST). The rest, keep in your bowl. 1. In a small pot mix together your sugar and water. 2. Bring to a boil stirring occasionally. Once it's reached a boil, take off heat and let cool. 3. Once cooled, stir in your 1/2 cup black cherry juice. 1. Take your baked and cooled 10" Devil's Food Cake and with a serrated knife, trim the top off (the domed part). You're wanting this to create a nice flat top to your cake. Pulse the domed scraps in a food processor until you've got crumbs. Spread on a baking sheet and toast in preheated 350*F oven until crunchy and dried out 7-10 minutes. Let cool. 1. With the remaining Devil's Food cake and your serrated knife, cut into 3 even horizontal layers. Remember to start with a sawing motion going from the outer edge of the cake in toward the center. 2. Set each layer aside, removing parchment paper off bottom layer. 3. On your platter or plate add strips of wax or parchment paper around edges (leaving nothing in middle) so that once cake is completed you can easily remove them from underneath creating a nice and clean surface! Place first layer of sliced Devil's Food cake carefully on top of parchment strips. I suggest saving the bottom layer of cake for your top assembled cake layer because once flipped over that bottom layer is your flattest and smoothest layer! 4. 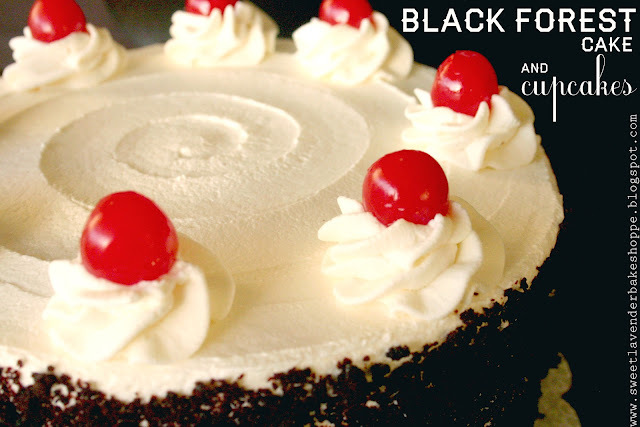 With a spoon or pastry brush generously add some of your black cherry simple syrup to the cake layer on your platter. 5. With your pastry bag filled with whipped cream frosting, pipe a circle around the edge of your cake and then another smaller circle in the middle. 6. 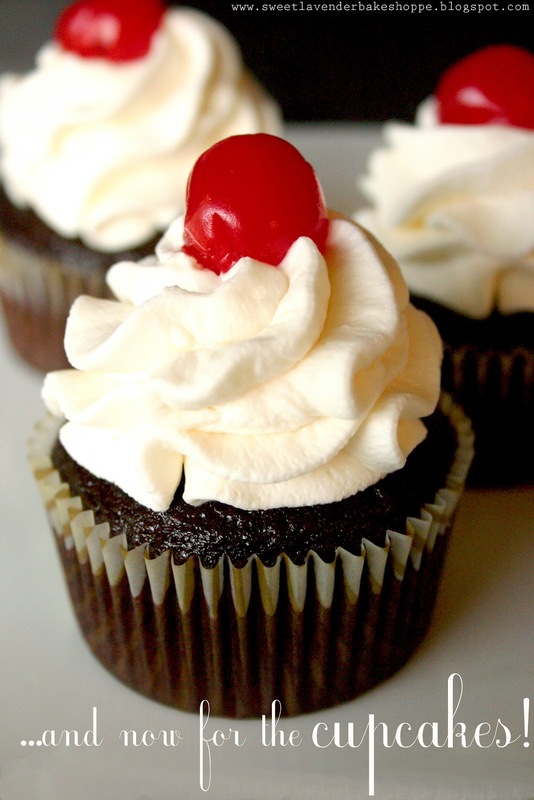 Take some of your chopped tart black cherries and fill the spaces between the whipped cream. 7. Place your next layer of cake on top, soak again with your black cherry simple syrup, pipe with more whipped cream like the layer before and again fill in the spaces with more chopped cherries. 8. Place your final layer of cake on top, smooth side up! Once more, soak this layer in your black cherry simple syrup. 10. Once your cake has been frosted, place in refrigerator for 30 minutes to set up (still on platter). 11. Remove from fridge and gently press those chocolate cake crumbs we made earlier into the sides, being careful not to get any on top. 12. With the remaining bag of sweet cream frosting, pipe 12 evenly spaced rosettes and top with a drained maraschino cherry! Gently and carefully remove your parchment strips. 1. Preheat your oven to 350*F. Place paper liners in 24 regular sized cupcake tins. Set aside. 4. When you've reached ribbon stage, stop mixer and scrape down bowl. Turning back on to low, alternately mix in the wet with the sifted dry ingredients. Stopping and scraping bowl every so often. Once all ingredients have been added, mix together once more. Try not to over mix as this will cause a dense cake. 5. Immediately pour batter evenly into 24 cupcake tins (filling up 1/2-3/4 of the way) and bake until cake bounces back when touched in middle and a toothpick comes out clean. Check after 15 minutes. Then bake in 5 minute intervals after- until toothpick comes out clean. 6. Let cool on wire rack until room temperature. 1. In a bowl of your mixer whisk your very cold heavy whipping cream until it's thickened slightly. Then with mixer still going, add in your vanilla bean sugar. 2. Mix until stiff peaks have formed and transfer to a piping bag fitted with a large star tip (Ateco 826 or Magic Tip 8ST). Make your simple syrup :) In a small pot mix together 1/2cup sugar and 1/2 cup water. Bring to a boil stirring occasionally. Once it's reached a boil, take off heat and let cool. Once cooled, stir in your 1/4 cup black cherry juice reserved from defrosted black cherries. 1. Once cupcakes are cooled, scoop a small amount of cake out of middle. With a squeeze bottle or a spoon, carefully drizzle in a hefty amount of your black cherry simple syrup. Then fill hole with chopped black cherries. 2. Pipe a nice and high rosette of whipped cream on top of cupcakes and top with a drained maraschino cherry! Hello!! This cake sounds Delicious!! It is my sister's favorite kind of cake, and I am planning on making it for her birthday party this weekend. I was wondering if you could tell me how long it stays "stable" (I am most worried about the whipped cream frosting) for? I have to drive about an hour to get to the party, and was hopping to make it about 24 hours before, but am afraid that it wont make the trip in tact. Any advice? Here's what I would do: Make the cake part a day or two (max) beforehand. Actually in all honesty you could make the cake weeks before, wrap WELL in plastic wrap and freeze. The day before (or the day of which would be best) compile the cake with cherries and frosting. If you want to do the whole thing 24 hours before, you'll be totally fine. I like to bake my cakes the day before assembly only because I like to give them a good chill in the fridge overnight (wrapped in plastic of course). This stabilizes them and makes them nice and cold for better frosting! TO drive- do you have a cake carrier? If so, put it in there and have someone hold your cake for ya while you're driving. If you don't have a carrier, place on a sturdy platter and again, have someone hold that cake for you during transit. I would definitely give the whole assembled cake a good chill in the refrigerator beforehand to ensure everything has had time to settle and won't move around. So if you make 24 hours ahead, you should be great! Just cover it with plastic while in the fridge so it doesn't absorb yucky fridge smells! Keep the inside of your car cool...drive carefully, and good luck!!! That's wonderful, thank you very much for your help! I will probably bake the cake tonight and put it together tomorrow :) Unfortunately I am traveling alone, but I do have a cake carrier, so *fingers crossed! * It should make it!